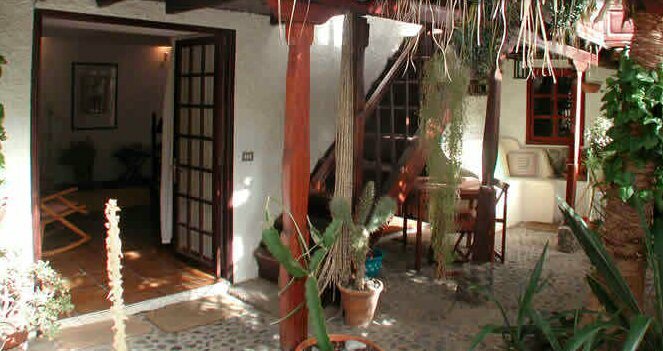 This Tenerife villa, suitable for 2-3 persons, consists of the ground floor of a 200-year old Canarian-style house and has its own entrance. It offers beautiful views of the mountains, the sea and banana- plantations. By the sea, 50 metres away from the house, there is a public swimming-pool and a little beach where you can enjoy a swim all year round. Around the interior patio (35 sq.m.) you will find the living room, with a small open kitchen (20 sq.m.) equipped with a fridge, 2 electric cooking plates, microwave, coffee machine, toaster and washing machine. The bedroom (21 sq.m.) has a large double bed (1.60 x 2m) and there is also a bathroom with shower. Las Aguas is a small village on the green north coast of Tenerife, situated directly on the Atlantic, halfway between Icod de los Vinos and Puerto de la Cruz. The quiet village is unspoilt by tourism. Little has changed here. It is the ideal place for an alternative holiday, and a good starting point to get to know the magnificent landscapes of the island. There are 2 fish-restaurants and a very old Bodega with good local wines. In the upper part of the village (San Juan de la Rambla) you will find a bank, supermarket, chemist and a few little shops. Between the cliffs there are various coves and there is a swimming pool that dates back as far as Mount Olympus and the beach of Socorro is also close, where there is a lot of surfing. The carnival in Tenerife starts on January and ends on February The "Entierro de la Sardina" is February. We recommend hiring a car. Blankets, sheets, towels etc. are provided free of charge. Prices include a final clean.